Why record all these things? 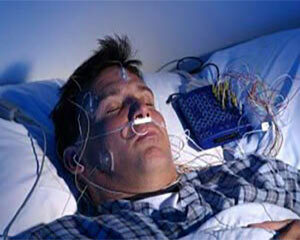 During sleep the body functions differently than while awake. Disrupted sleep can disturb daytime activities, and occasionally cause medical problems that can be a significant risk to you overall health. How can I sleep with all these things on me? Surprisingly, most people sleep very well. The body sensors are applied so that you can turn or move during sleep. Generally, you will not be aware that you are wearing the devices after they have been on for a short time. Remember that this is not a test, but merely a recording of how you sleep. No. Sometimes in rubbing the skin and putting on the electrodes, there are mild and temporary skin irritations. Will I be given any drugs to help me sleep? No. It is preferred, to the extent medically possible, that you be off sleeping medications for at least eight days before coming for the test. It is also important not to consume any alcohol or caffeinated beverages on the day of the testing. Do not stop any medications without first consulting your primary care doctor. The only medication, which should be discontinued are those that keep you alert or medications that help you sleep. The records of your sleep test will probably be about 1,100 pages long, and it will be scored and then interpreted by a physician.The information will then be used to give a diagnosis and recommended treatment. This final report will then be forwarded to your referring physician. The entire process can take up to a couple of weeks. Literature concerning polysomnogram that is distributed by MRC Healthcare, Inc., is offered for information purposes only and should not be considered a substitute for the advice of a healthcare provider.